The kitchen roof is slanted to create a double volume above with clerestroy windows from huge Master deck and gallery. All of the bathrooms have glass mosaic and Italian ceramic tile. Upstairs is the master suit with 3 additional bedrooms, two baths and a laundry. Wood floor with a dark stain is on second floor with carpet in the bedrooms. The landing above over looks and the kitchen and down into spaces below through to the entry. The exterior spaces are located down the side of the house and off of the den creating indoor / outdoor common areas. 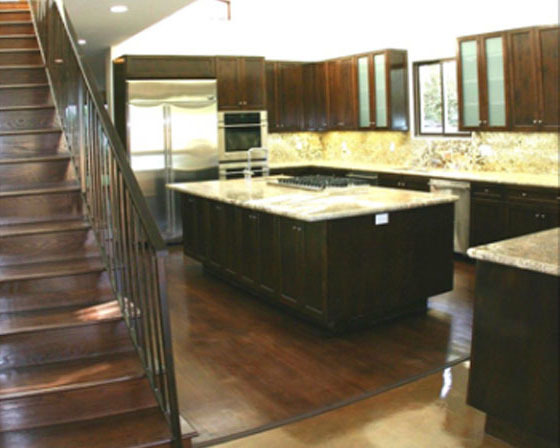 3 zone HVAC, data, central vacuum and surround sound are incorporated into this Luxurious home. Ground up New home in Beverlywood. Grading at the back of the property was the first phase and required a New 15 foot Retaining wall. Footings and smaller walls became the groundwork/ foundation for the home with a methane mitigation system installed. The open plan layout with double volumes, stepping up the slope make this Contemporary / Country’s esque style home, sit like a castle on the hillside. 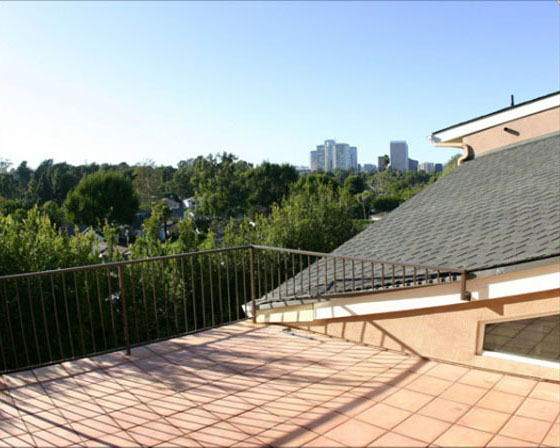 Views of Century City and the Hillcrest Golf course are seen from all Bedrooms and the Living Area. The first floor is concrete slab polished and stained with a wash and then sealed with epoxy. The Entry/ Living / Dining / Den / yard / Guest suit and Powder room are located on the first floor level. Second floor has 4 bedrooms and 3 baths all with slab counters and natural stone tile. The Huge volumes and spans were created using structural steel , which we exposed and clear finished throughout.